For jobs in animal welfare, in a charity, and working with dogs and cats. 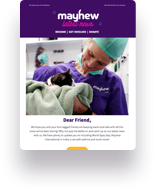 Take a look at Mayhew's latest job vacancies. The Mayhew team is made up of a wide range of roles and skill sets. From fundraising to kennels, there are plenty of opportunities to make a difference to the lives of our animals. We are looking for someone to join our clinic team in this new exciting role. We currently have a vacancy for a Registered Veterinary Nurse. You will be joining a team of like-minded, passionate individuals with a genuine interest in animal welfare. We are looking to recruit a highly motivated Registered Veterinary Nurse. Mayhew is an accredited London Living Wage employer. This means that every member of staff in our organisation, including permanent staff, contractors and suppliers, earns not only the minimum wage but the Living Wage. The Living Wage is an hourly rate, set independently and updated annually, based on the cost of living in the UK. Find out more about the London Living Wage.